The five Yamas are part of Pantanjali’s eight limbs of yoga. Each limb represents an aspect of yoga to help you discover a deeper connection to your highest Self. The Yamas, as a group, represent the first limb. All the Yamas build on and relate to each other. They are interconnected, yet each presents an area to delve deeper into thoughts, words and deeds and explore a better way to live harmoniously. The first Yama, Ahimsa, means non-harming. You can read about it here. It’s most important to remember the deepest truth that we are all timeless; we are already whole and complete, even when it may not be easy to accept. Facing the truth and speaking the truth can be daunting. It can also be liberating. 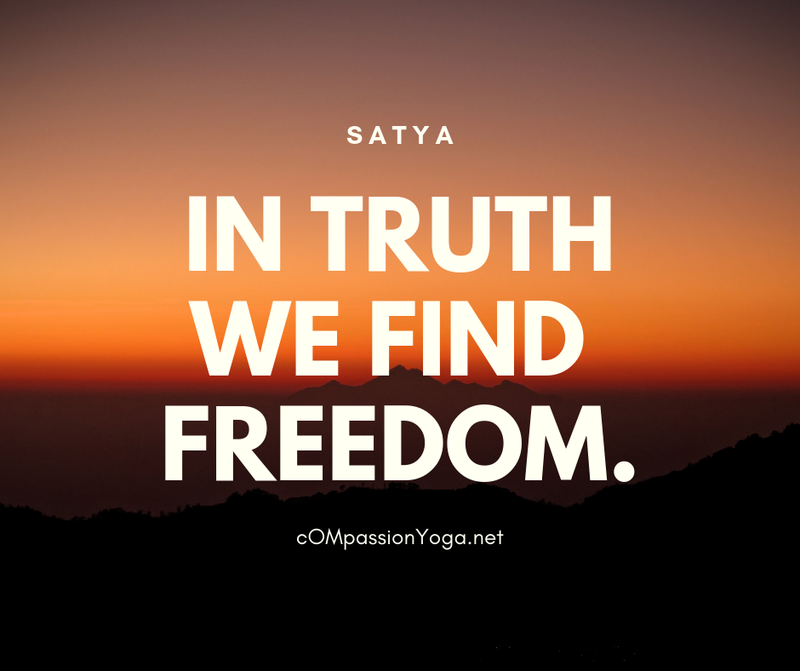 In truth we find freedom. Here’s a short practice to help you deepen Satya in your daily life. This week, take a few minutes in the morning to experience the practice. Throughout the week, be aware of your actions. You can choose to lie down or stand. Experiment trying the practice both ways to see what feels most appropriate for your body. Choose to lie on your back in Savasana, palms up and legs relaxed or stand with your feet hips width distance; check to see that each foot is centered directly under the hip bone. Close your eyes and bring your awareness to your center core. Ask yourself, “What holds me back?” Create an affirmation to release this roadblock with a positive affirmation. For example, if your roadblock is not speaking up for yourself, your affirmation could be, “My voice is clear and strong..” If it’s a self-sabotaging habit like procrastinating you could say, “I take timely action to achieve what I need to do.” Make your affirmation positive, use “I” and express it as if it’s happening in the present tense. Whether standing or lying still, place your hands at the space above your naval in the v at the base of your ribs. Breathe in deeply drawing the air energetically up through the legs. Let the belly soften and expand. Breathe out slowly and deliberately all the way back down through the legs and feet. As you exhale, tighten your core. On your next inhale, keep the core strong and feel the ribs expand. Take 10 deep rounds of breath into the ribs and back, keeping an energized core. With each breath in repeat your affirmation. Sometimes living in truth takes courage, conviction and strength. With each inhale feel yourself growing stronger in your conviction. After 10 breaths, soften the core and breathe normally. Repeat your affirmation again, relax and allow it to expand throughout your body. You have the courage and strength to embody your truth. You are enough. Live in Satya.